Some friends and I recently dined at one of Asiatown’s newest (it opened this summer) and most unique restaurant, Han Chinese Kabob & Grill. 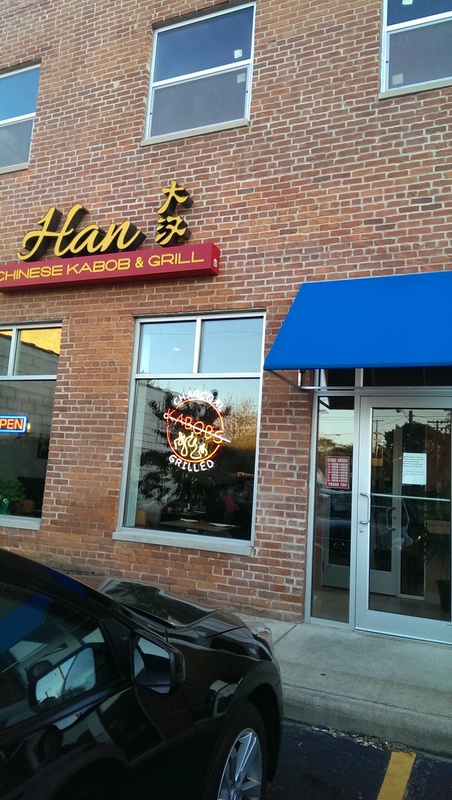 Han Kabob (as I will call it) is located in the small strip mall on Payne Avenue just west of E. 40th in which Map of Thailand and Koko Bakery are located. 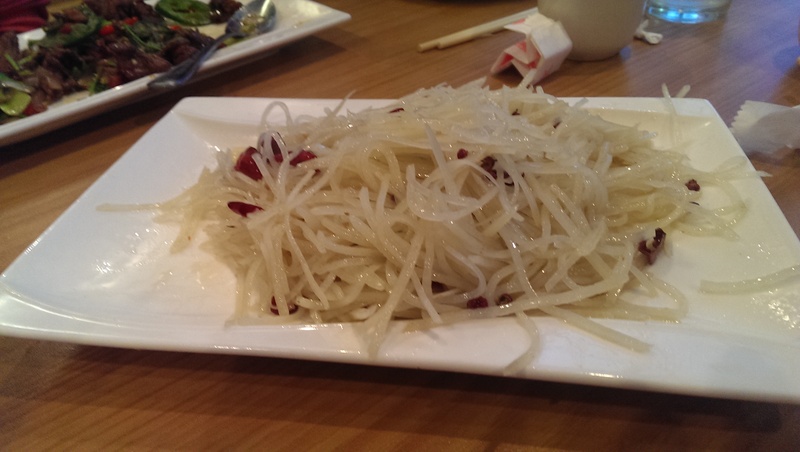 It is small, yet turns out consistently good Northern Chinese food. The decor is modern without all the kitschy Chinese trappings. They are appealing to a younger, more modern diner and attract a lot of students in the area and from as far as Kent and Akron. The diners around us were mostly young Asian-born students, which lent it a great vibe. It is also open late, usually until 10:30 or 1:30 PM (note: they are closed on Wednesdays). 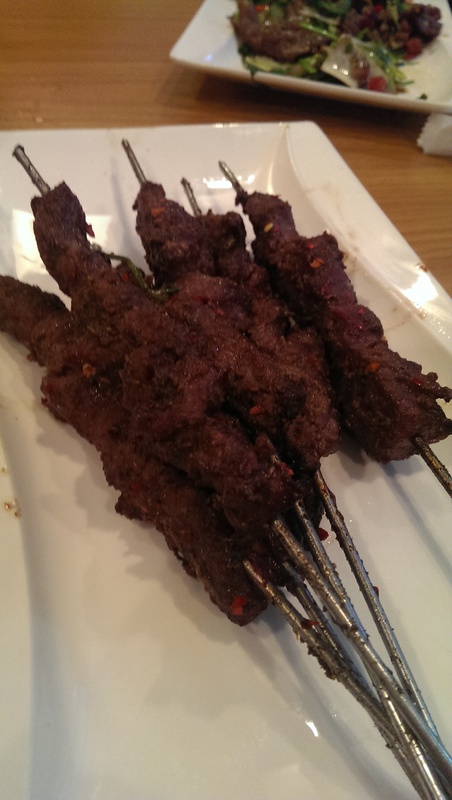 They are the only Chinese restaurant in Cleveland to serve grilled meat kabob skewers, such as grilled lamb, chicken, beef, squid, and other choices. Not all of the skewers are served every day, but the signature lamb kabobs are. The lamb kabobs are marinated and garnished with lots of cumin and spice and grilled fresh. There were eight of us, and we were seated at a comfortable table that allowed us to talk easily amongst ourselves and pass our food around. We are a bunch of sharers, so we were all able to try the numerous dishes. I started my meal ordering the lamb kabobs for the table and a wonton soup. The wonton soup was quite a large portion that could easily serve two. 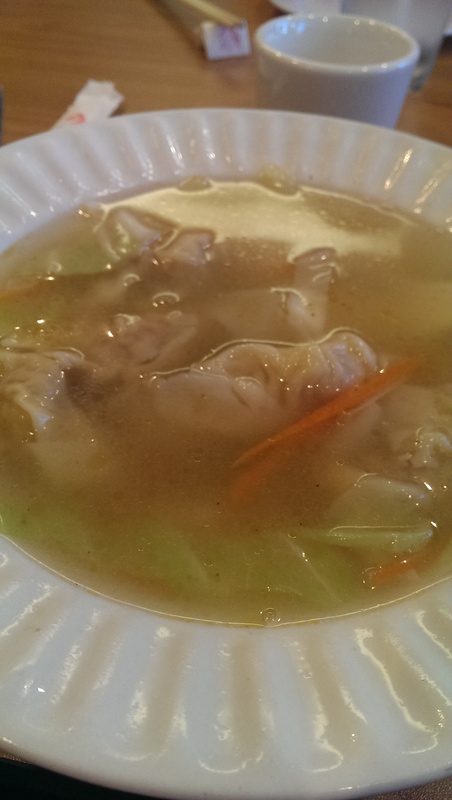 It featured five or six wontons, lots of fresh bok choy and carrot strips in a flavorful broth. The wonton lover in me savored every dumpling. The wontons had a nice pork filling, and I really liked the addition of the cabbage to the soup. Ordering an entree was a tough decision, because there were several things that sounded wonderful to me. Luckily someone else planned to order my first choice, the crispy fish in a sweet and sour sauce, so I ordered the pork with garlic sauce. I loved it. It had a nice subtle spicy kick to it. The pork was cut into thin strips and served with some vegetable strips and chilis. The large bowl of rice for the table cut some of the heat. I have to say that out of all the entrees that the table ordered the whole crispy fish with sweet and sour sauce was my favorite. The sauce was not at all the gloppy orange sweet and sour stuff that is so ubiquitous at Chinese restaurants here. As you can see from the picture it was a brown sauce that was scrumptious. It was delicious and was worth the wait (we aren’t sure if it took that long to prepare or if the waitress forgot to put it in to the kitchen, but it came out after most of us were finished with our meal). The fish was crispy outside and perfectly cooked inside. 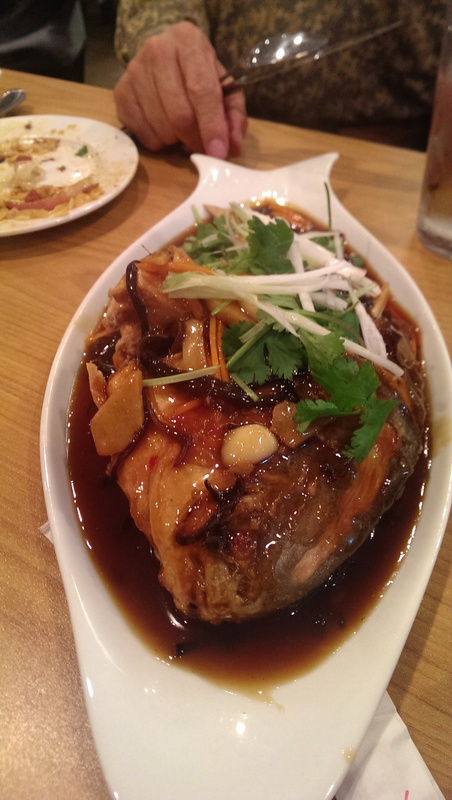 I particularly loved the bright sauce and the fresh ginger and aromatics served on top of the fish. I can’t wait to go back and order this again for myself. Some of the other dishes we enjoyed included the Yuxiang Shrimp (which had a sauce that was very similar to my entree’s garlic sauce), a spicy lamb special (which was even better than the kabobs with a nice jalapeno kick to it), a chicken dish, the shredded potato salad (pictured to the right), a crispy squid special, and a pork belly with pickled vegetables that was very similar to sauerkraut and pork. 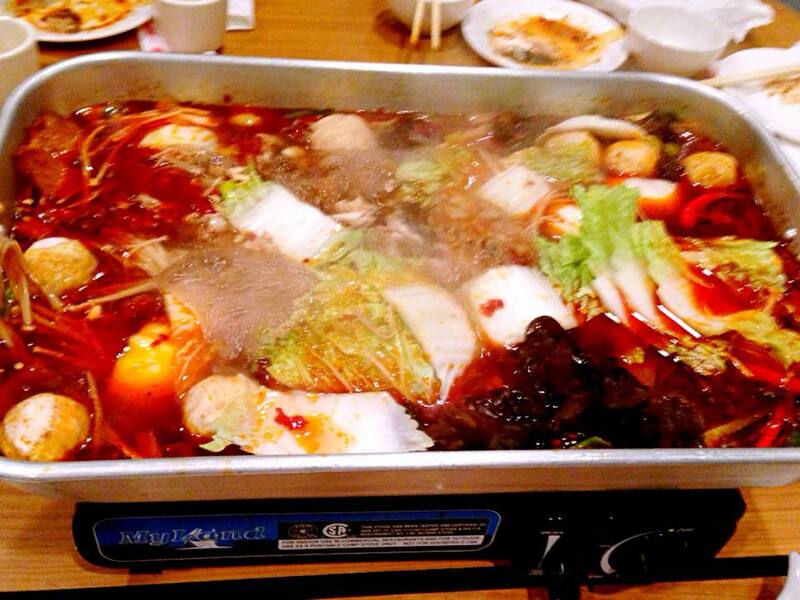 Several tables of Chinese diners were enjoying a huge boiling pan over a tableside grill. It was the Hot Pot, which was described to me as a kind of Chinese fondue in which various meats and vegetables are boiled in broth. It is apparently the ultimate test of Chinese spiciness. Choose what you’d like to cook in the soup: ultra-thin beef slices, cabbage leaves, needle mushrooms, potato slices, etc. It’s a secret menu item for the brave souls only – some Chinese people can’t even handle the spicy level! I was a bit dismayed to note that there were no drinks offered other than water and tea – at least our waitress didn’t offer any to us. But on the bright side I was not tempted to order a cocktail or soft drink, which my diet appreciates. The restaurant was great. The bill was very reasonable. There was not a single dish I disliked. Everything here was delicious, and we all left very happy.